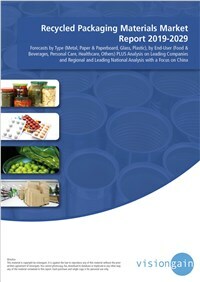 The latest report offers a comprehensive analysis of the global Recycled Packaging Materials market. The key player assesses that this market will generate revenues of $153,303mn in 2019. Now: Many major players are continuously focusing on the expansion of the business by acquisition and collaboration. Major player have adopted the organic strategy of acquisition and collaboration to minimise the competition and expand the market. This is an example of the business strategies that you need to know about – and more importantly, you need to read this objective analysis of how this will impact your company and the industry more broadly. How are you and your company reacting to this news? Are you sufficiently informed? Read on to discover how you can exploit the future business opportunities emerging in this sector. This new study tells you and tells you NOW. In this brand-new report, you find 82 in-depth tables,80 charts and graphs; the 168-page report provides clear, detailed insight into the global Recycled Packaging Materials market. Discover the key drivers and challenges affecting the market. By ordering and reading our brand-new report today, you stay better informed and ready to act. Report will be released for delivery on April 15, 2019.